Last summer I took my 2-year-old daughter fishing on Rock Creek - her first foray on this blue-ribbon trout stream, one that my father had taken me to. We kept two brown trout for dinner. As I was preparing the pan I let her fondle the fish. I looked down and told her that we would be eating them for dinner. She looked at the fish she was holding, looked at me, and then took a big ol' chomp out of one of the trout. I exclaimed, "Cid, we gotta cook 'em first!" She just looked up at me and smiled. These are all places I want to take my family in the years to come. These are places where the wind sighs through the lodgepoles, and bull elk bugle from deep timber. They are places where cold, clean water laughs over boulders and the laughter from our family echoes. I'm excited about this legislation because it perpetuates the legacy given to us by Theodore Roosevelt - public hunting and fishing for everyday Montanans like me and my family. 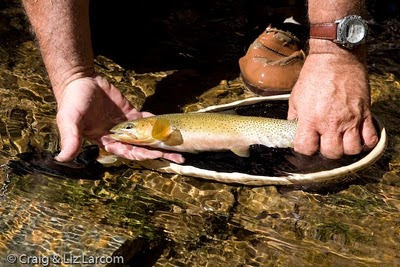 Not only does this bill guarantee access, it will protect headwaters and restore fisheries. This is key as Montana continues to change - we need to keep as much the "Last Best Place," the last best place. This is what makes Montana, Montana. That means protecting security habitat. Big game requires big country to thrive. Security habitat is described by many as larger than 250 acres and at least one half mile from motorized traffic. Places like the West Pioneers and Monture Creek will forever stay places where big game can flourish - Tester's bill ensures that. Another thing I like about the act is the logging component. My grandfather has been logging his place just out of Missoula for decades and the health and vibrancy of his 120 acres is readily seen. Like all Montanans, I've watched while our forests have been assaulted by the pine beetle epidemic. These places have changed dramatically, and the fire danger in many areas where we have summer cabins is tremendous. Logging will thin stands near these places where fire danger is high and threatens human structures. But more than this, stewardship logging components of the act will help our elk hunting by reducing road densities on some parts of the national forests, repairing roads in other places, and bringing much needed rehabilitation to places that really need it. The Forest Jobs and Recreation Act enhances many areas on our national forests that are in need of restoration. On the Beaverhead-Deerlodge National Forest, for example, 85 percent of all culverts on streams pose some kind of barrier to fish passage. The numbers are even higher on the Lolo and Kootenai. Culverts often prevent fish from moving up- and downstream for spawning, thus preventing thriving fish populations and epic fishing days. Tester didn't stop here either. There are more than a quarter million acres that will be designated for motorized vehicles like ATVs and snowmobiles. Families who like to get out and explore on ATVs will have a place to go. What's more, Tester did a remarkable job of not closing existing roads; more than 6,600 miles of roads and trails exist on the forests in his bill. FJRA closes less than 50 miles of roads and leaves the rest open. Montana has changed a lot in my lifetime of growing up here. It's changed since I started a family and it's bound to change some more. Tester's bill is Montana; it unites loggers and wilderness activists, backcountry hunters and ATV users. It's heartening to realize that with this visionary legislation, Montana's wild places and wild adventures will stay the same, providing the next generation of Montana sushi girls a place to etch their own memories. Land Tawney is a fifth-generation Montanan who grew up with fly-rod and rifle in hand. He is the president of Hellgate Hunters and Anglers in Missoula.